When I throw a party, I usually don't want to spend the whole night in the kitchen. I would prefer to have mostly "grab and go" items that can be left out either at room temperature, or in sterno's if need be. 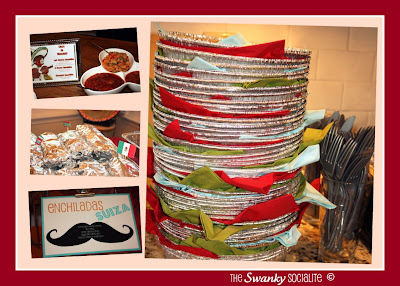 For my Cinco de Mastalski party this past weekend, I used these take out containers that I stacked with the napkins already in them. The big hit of the night were the "grab and go" shredded beef burritos that I made and kept wrapped in foil. By keeping them over the sternos, they stayed warm for a good portion of the night. Keep these ideas in mind the next time you have a party and you don't want to be the boring hostess that has to camp out in the kitchen! You can usually come up with a good grab and go menu for any occasion!